This waterfall is in two main drops: the upper is a rounded cascade which transitions into a plunge, while the lower splits into a couple of plunges as it falls over a craggy ledge. When flowing at full force, this is one of the most impressive falls in the area. It is a powerful, thundering sight. Since it's located just below Glenville Dam, however, the water is diverted around the falls most of the time to the powerhouse far downstream. Only a small amount of water flows when power is being generated - whatever seeps out of the dam or flows into the river from tiny side-streams below it. 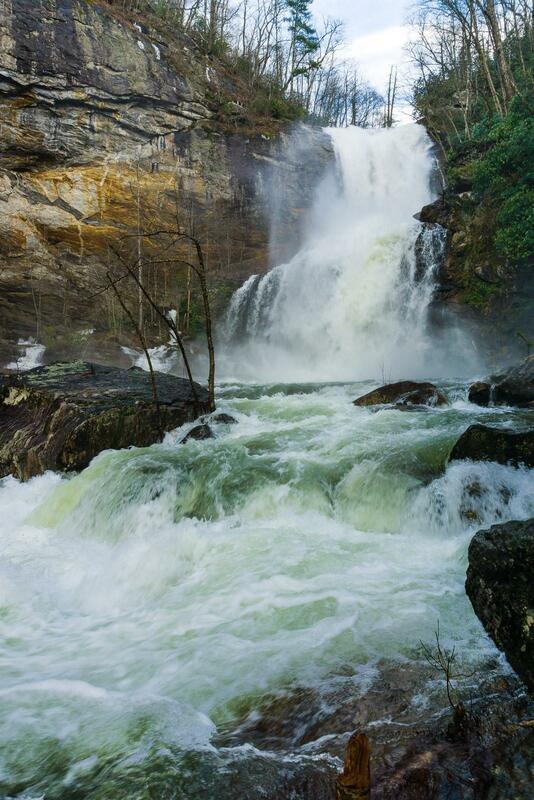 For the full experience of the natural force of this waterfall, visit when the water is high. For a chance at close-up exploration (and perhaps better conditions for photography), visit when the water is low. But how do you know what the water level will be? Well, this waterfall has a schedule! As part of re-licensing its dams with the government for the next 30 years, Duke Power has agreed to let some water over the falls on a regular basis several days per year, primarily for whitewater kayaking in the stretch of river downstream. But water is also released during periods of heavy rain or when the lake is lowered for maintenance. Duke Energy's scheduled releases page. Select Nantahala from the drop-down, and look under West Fork to see when the water is being released. A link to a calendar for upcoming release days is on the right side of the page. American Whitewater's page on the river. From the I-40 and I-26 interchange in Asheville, NC, take I-40 west about 18 miles to Exit 27 for the Great Smoky Mountains Expressway, US 74/19/23 toward Waynesville. Follow the expressway for about 21 miles to Exit 85 for Sylva/Cullowhee. Follow Business 23 for about 1.8 miles into town and turn left on NC 107. Go just over 20 miles on 107 (past Western Carolina University) and turn right onto Pine Creek Road. It's 2 miles on this crooked road to The Pines Recreation Area, just across the dam, where there is parking on both sides of the road for the trail. From the parking area away from the lake, the trail begins as a gated road leading down below part of the dam. It winds downhill on a graveled path to a hairpin turn near a drainage basin, then turns right at a sign. From there the trail becomes much steeper and descends sets of log steps toward the river, which it begins following downstream. The trail will cross a couple of unique, small bridges and then descend steeply on rock steps. Only short stretches are actual dirt trail. You'll see how much work was required to build this trail - hundreds of massive logs and stones (sourced from on-site) were put into place to keep hikers safely on the path. The trail passes by an upper waterfall, called First Falls, and then under a neat overhanging cliff as you go past the brink of High Falls. The trail then descends on rock steps through switchbacks beside the upper part of High Falls to reach the put-in at its base. If the water is flowing, the last set of steps will be soaked from the spray, and completely iced over during freezing weather. Some words of caution: water can potentially be released from the dam at any time without notice even when it is not scheduled, so be very careful if visiting on non-release days and always expect the possibility of rapidly rising water levels. Also, all the property downstream of the kayaker put-in is private property, so keep off. The put-in is not the optimal viewing area for the waterfall when the water is high (it's right in the spray zone so you'll get soaked), but crossing the river on foot isn't an option either. So don't get swept away trying to get a better view, or arrive in the morning before the release starts and get trapped on the other side of the river, either.